The Three Swans is a traditional, historic coaching inn dating back to the 17th century. It has grade II listed building certification and still maintains the original archway where the horse and carriages would enter the courtyard. 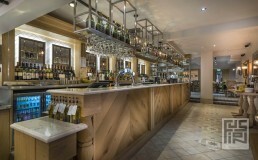 It is located in a conservation area centrally in the market town of Hungerford, Berkshire. Historically this is an important building to the local community providing a hub for early morning coffee through to fine dining in the evening. The overall brief was to consider the sites context paying considerable attention to the history of the building and sensitivity to the community and conservation area. 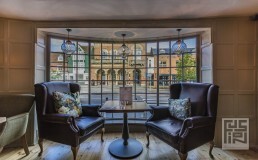 Our clients aim was to provide a new lease of life to this historic building to encourage the local community back to the heart of the village by creating an inviting, comfortable and desirable hotel, pub and eatery. The existing 24 bedrooms required extensive upgrading and remodelling to incorporate two suites and a variety of standard double bedrooms. 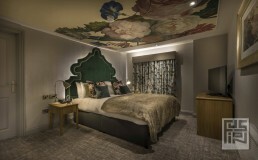 These were to enhance and update the lodgings providing a designated relaxing respite for tourists, with beautiful rooms connecting back to the heritage of the coaching inn whilst being inspired by the local area. What was once a dark austere interior has been updated with a neutral, fresh colour palette as a backdrop to a beautiful mix of rich plain velvets with feature floral and woodland designs providing a link to the scenic Berkshire countryside. Considering the local community, soft informal warm leathers and wool finishes in the bar encourage dog walkers and hikers to take sanctuary in the bar, accompanied with practical but attractive hardwood and decorative tiled floors throughout. Restoring the existing beams and wall panelling to retain the character of the inn, complimented by the modernity of mild steel over bar details, decorative lighting and bold, opulent fabrics creating a comfortable and inviting pub with a luxurious, restful ambiance.